The annual CFL Pink Week features our Argos & the green Riders. The regular season home finale at BMO features two teams looking to get on track heading to season’s end. The Argos join the Riders in the final season opener at Mosaic Stadium. Will be an encore of the Argos last visit to the prairies? June thinks so. 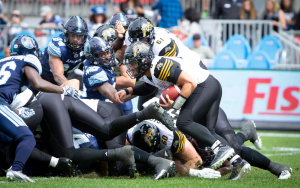 After six long weeks, the Argos finally come home to the friendly confines of Rogers Centre. They welcome the 0-6 Riders. Here’s what you need to know prior to kickoff. Week 2 brings the Argos to the heart of the prairies to take on the Roughriders. Does Foley dominate in his return to Riderville? Does Harris continue his dominance? Can I come up with three rhetorical questions?